Over the last few years since our beta went live, the over 1,000 issues logged on Cyclescape, and being discussed by members of the site, contain a wide range of concerns. It's interesting to see the kinds of issues that act as a barrier to greater cycling around the UK. Common things include lack of cycle parking, dangerous roads, collision-prone junctions, missing links, scrutiny of new cycleway proposals, and new residential/commercial developments that will affect cycling. The last of these examples - planning applications, are interesting as they often represent both dangers and opportunities for cycling. For instance, a major new housing development could result in a lot of new traffic on an already congested roads. However, there could also be an opportunity, as councils are able to negotiate "planning gain", known as Section 106 agreements (or Community Infrastructure Levy), where public infrastructure nearby is improved - such as a new cycle route, cycle parking, or traffic calming measures. However, it is crucial that cycle campaigners know about planning applications as soon as possible, to maximise the chances of pursuading the local council to negotiate Section 106 proposals, and to give more time to look through often lengthy and complex documents for potential problems. Planning application websites are often hard to use, fail to provide a proper map view, and in general are not orientated towards monitoring of cross-cutting concerns like cycling. Discussing a planning application relies on someone actually knowing about a planning application (that might have effects on cycling) in the first place. 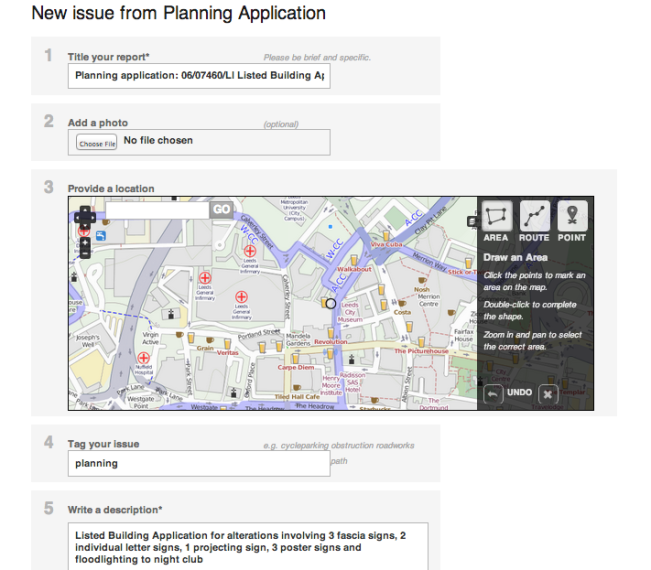 Of course, Cyclescape enables people to add planning applications as an issue like any other. However, we think there is a better way - having planning applications automatically appear on the map as a potential issue. So we've been working on a way to automate this. Using data from Openly Local, we plan to add a new tab to the overview page, so that any member of the site can 'promote' a planning application that looks like it might be of interest to an issue automatically. We think that automated listings of planning applications will be a powerful new feature of the site. The motivation for this has come from Cambridge, which is a considerable growth area, and where the local cycling campaign spends a lot of time scrutinising planning applications. 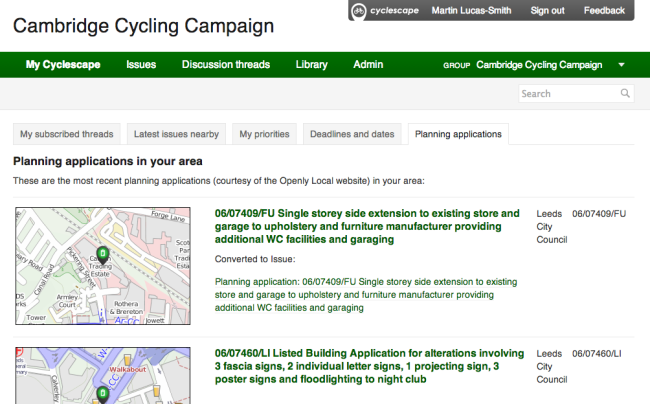 The vast majority of planning applications on the Cyclescape site are indeed from Cambridge. This work for Cambridge has been gratefully funded by Cambridge Sustainable City who awarded a grant for Cambridge Cyclescape. If you're interested to help develop the code, any contributions would be very welcome, on the 'planning' branch. We now have completed the integration and user interface code, but are awaiting availability of the data, which will come from Openly Local.